Me: Davey, do you think I sing the best when I sing high, medium or low? Davey: I think you sing best when you sing solo……… So low I can’t hear you. And that’s what three years of marriage looks like, and I couldn’t love it more. We celebrated our third anniversary this week with an absolutely divine dinner at the recently opened Kindred in Davidson. I think I’m still digesting all of the sumptuous treats we devoured. Here’s a look at what we’ve eaten the past two weeks, which has been a real mixed bag of results. But! We’ve scaled our weekly grocery budget back from $100 to $80 a week, and it’s been nearly painless. I’ve fallen pretty deeply in love with Aldi, and have become a little “A Beautiful Mind” with our meal plan, but alas, I’ll take that $20 savings any day. 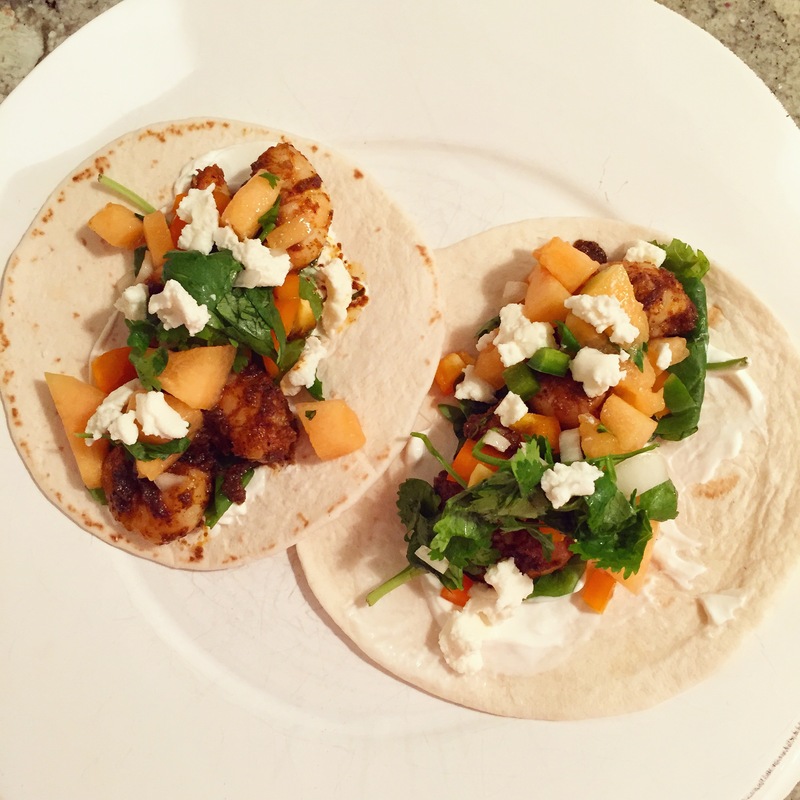 Jerk Shrimp Tacos + Melon Salsa – I loved the concept of this dish (pictured above). Even though I don’t care for cantaloupe, the melon salsa was a great complement to the spicy shrimp. Unfortunately, our shrimp was HELLA spicy because we’d run out of cinnamon to soften the blow of the jerk spice. Davey the Hubbers and I love spicy, but holy-five-alarm. General Tso’s Chicken – We are no strangers to making our own Indian and Thai dishes at home, but this was my first time tackling Chinese. I loved this dish, and the leftovers were delicious too. Admittedly, David wasn’t quite as thrilled as I was. He’s a regular General Tso’s orderer (I have never ordered it), and he was expecting it to taste like cheap Chinese takeout. It does not. Despite that incongruity, this will be part of a future meal plan. Buffalo Chicken Whole Wheat Calzones – I made a Frankenrecipe out of this BBQ Chicken Calzone recipe and this Buffalo Chicken Enchilada recipe. These turned out super hearty. Next time I’ll add more buffalo sauce and more cheesy, as my filling was a little sparse in the dough-to-filling ratio. Also, huge props to Trader Joe’s whole wheat ready-made pizza dough to make these a super quick dish. Falafel – More like Fail Awful. I tried 4 times this week to make falafel using a local restaurant recipe. The flavor was delicious, but they completely fell apart when fried, crumbled when baked, and did zero things when seared on a cast iron. We sort of hand smooshed some remnants from our attempt at the fried batch enough to throw them on flax pitas with arugula, shredded carrots and feta. Samosa Pie – After a week of mediocre dishes, I was thrilled to add a favorite back into the menu. As always, I use ground lamb instead of turkey or chicken, and it is the very best. Creamy Spring Vegetable Rigatoni – A big fat “meh” on this dish. After following the recipe as written for lunch, I was severely underwhelmed. I tried to spruce it up for dinner by doubling the parmesan, lemon, and ricotta and liberally seasoned it with black pepper and sea salt. I also added some seared andouille, because when in doubt, ANDOUILLE. Even still. Meh. Cheddar Jalapeno Turkey Burgers – I had hoped to grill these burgers, but with this week’s perma-drizzle, I settled for a cast iron, and still loved these. We topped with avocado, muenster and avocado and served with roasted okra and kale chips. Yes please. Chicken Mole – After the failure of our other Blue Apron attempt (we used the recipe only, not the service), I’m reluctant to give this one a whirl, but it looks delicious, soooooo we will see.